If you thought last week delivered a super-punch to your emotions, get ready for an uppercut. This week's episode, titled "In Search of Lost Time," picks up right where we left off last time to resolve two big plot threads: J'onn coming to terms with M'yrnn's deteriorating mind and Lena dealing with Sam's true nature. M'yrnn is performing several Martian practices to keep his mind sharp, including one that moves his memories to the undamaged parts of his brain. But M'yrnn is extremely powerful and it's not quite working as well as he believes/hopes. J'onn recognizes this early but initially doesn't say anything...until it gets so bad that everyone in the DEO is brawling with each other. Of course, at the center of this hardship is the moment when an adult must take over the parenting—Kara even quotes her Uncle Jor-El who said, "The son becomes the father, and the father becomes the son." Last column, I mentioned the award-level acting going on, and it continues this week. 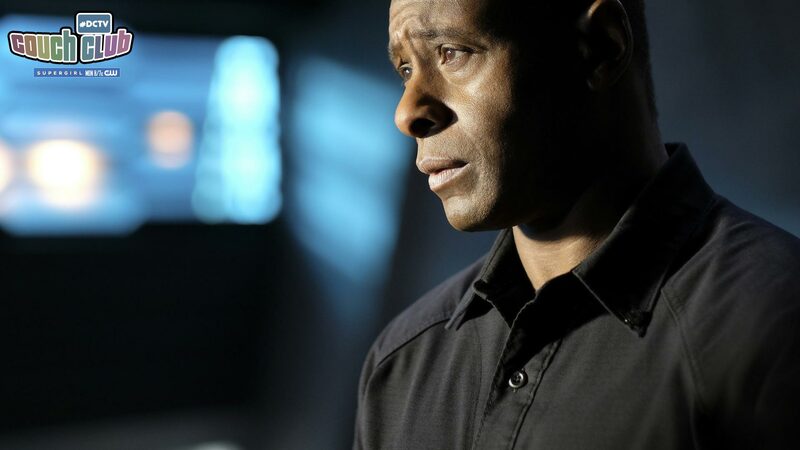 David Harewood and Carl Lumbly have fantastic chemistry and both delivered excellent performances of very emotional, difficult material. Lumbly exhibited every emotion with deftness—mirth, anger, despair, wryness, and, most devastatingly, fear—and Harewood matched him perfectly. The scenes where he talks about his father losing the thing that got him through hundreds of years of scholarship and imprisonment and when M'yrnn finally relents to having his psychic powers dampened are the most powerful of the episode. And their strength is only enhanced by the fact that both of their perspectives are shown clearly and strongly. Part of me is still angry that Papa J'onzz is not perfectly healthy and happy, but I'm glad to have seen such great performances. Speaking of strong emotions, Lena wakes Sam up from her medically-induced coma and triggers an emotionally-based transformation to Reign to get her to believe the truth. Odette Annable puts in another strong performance as Sam processes what's happening to her. Katie McGrath also continues to shine, quickly pivoting to Cruel Lena when necessary before returning back to normal. Lena and Sam's friendship was very apparent throughout, even when they were trading gibes, precision cuts and wild swings respectively. The fact that they're not drawing this particular thread out further is a wonderful relief. I feel like I bring up pacing a lot, but I have no regrets because it's one of the most important things for a show and stories, particularly ones with long arcs and large casts. It's far more interesting to see characters grapple with changing situations than deal with the same thing over and over and over and over. Watching Lena and Sam try to solve this situation on their own (at least initially) is the most interesting path right now and I'm looking forward to seeing how it unfolds. M'yrnn affecting everyone's aggression (except Mon-El, since his Legion ring also shields him from psychic attacks) allows Kara to finally express some of the anger she's been suppressing towards Mon, maybe even unknowingly. I feel like it was a very cathartic moment for, not just Kara, but a ton of people who watch the show. Mon was a big jerk—he knows this, we know this, everyone knows this. But hearing Kara actually list previously unacknowledged problems and admit that she was so busy missing him and romanticizing their relationship to remember the downs was huge. It's very difficult to discuss and confront the less-than-stellar behavior of a loved one, even just within yourself and especially as a "nice" person. Seeing Mon and Kara discuss it like grown-ups was great. Speaking of Mon-El, we got to see him in his ORIGINAL COSTUME. *Airhorns* It was a great adaptation of his comics costume and featured a lovely, subtle outline of the S Shield on the chest. And we got to see him patiently and good-naturedly train Kara in cape tricks. This is definitely one of the best illustrations of how much better a person he's become, and it was fun to see their places kinda reversed since he's become a seasoned hero. The episode started with the gang playing charades and M'yrnn shape-shifted, claiming he was unaware of the rules. We also learned J'onn had an imaginary friend as a kid—a fifth-dimensional imp named Zook (a reference to an actual DC Comics character that served as an adorable sidekick/partner to the Martian Manhunter in the 1960s). Adorable scene is adorable. I'm sure I'm not the only one who was reminded of Sarek's self-titled episode on Star Trek: The Next Generation where Captain Picard helped him with his deteriorating mind. James and Lena's relationship is solidified with his non-pushy support of her dealing with "helping a coworker" (which is generally true). He gives her the advice that leads her to forcing Sam's transformation (allowing her to both show her the tape and get very important data) and brings her dinner so she doesn't forget to eat. Their chemistry continues to evolve and I just really like seeing them flirt. I like how Alex was a one-woman wrecking crew during the massive DEO fight. Respect. With Kara and Mon-El enjoying another milestone in their friendship, their patrol flight is interrupted by dead birds falling from the sky—a sure sign that Pestilence's reveal is close. So far, her identity has been shrouded. Is it possibly someone we've already met? Probably not. I think a bigger question is how powerful is she, particularly since she can survive hundreds of years to become a universe spanning mega-villain? What did you think of the episode? Did you expect M'yrnn be able to cope on his own? Did you think Sam would accept her dual nature so soon? Is Lena the key to saving the future? Should shapeshifting be allowed in charades? Share your thoughts on these important questions and whatever else you’d like to discuss in the comments below. Tamara Brooks covers Supergirl as a part of the #DCTV Couch Club. Look for Tamara on Twitter at @MisfitsTamara. Supergirl airs Mondays at 8 p.m. (7 p.m. CST) on The CW.